Female leatherback sea turtles travel great distances to return to their natal beaches to lay eggs. A new study examines how they choose their nesting sites. CHAMPAIGN, Ill. — The enormous, solitary leatherback sea turtle spends most of its long life at sea. After hatching and dispersing across the world’s oceans, only the female leatherbacks return to their natal beaches to lay clutches of eggs in the sand. A new study offers fresh insights into their nesting choices and will help efforts to prevent the extinction of this globally endangered giant of the sea, researchers said. A report of the new findings appears in the Journal of Herpetological Medicine and Surgery. 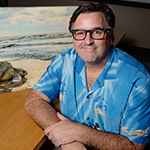 “Leatherbacks are the largest of the sea turtles: The males can grow to more than 1,800 pounds and the females are 600 to 800 pounds,” said University of Illinois veterinary clinical medicine professor Dr. Mark Mitchell, who led the study. Mitchell also edits the journal in which the study appears. Some leatherbacks migrate up to 7,000 miles between their hatching and feeding areas, with females making return trips to lay eggs every two or three years. “Their ability to get back to their natal beaches without some GPS tracker to show them where to go is pretty impressive,” Mitchell said. 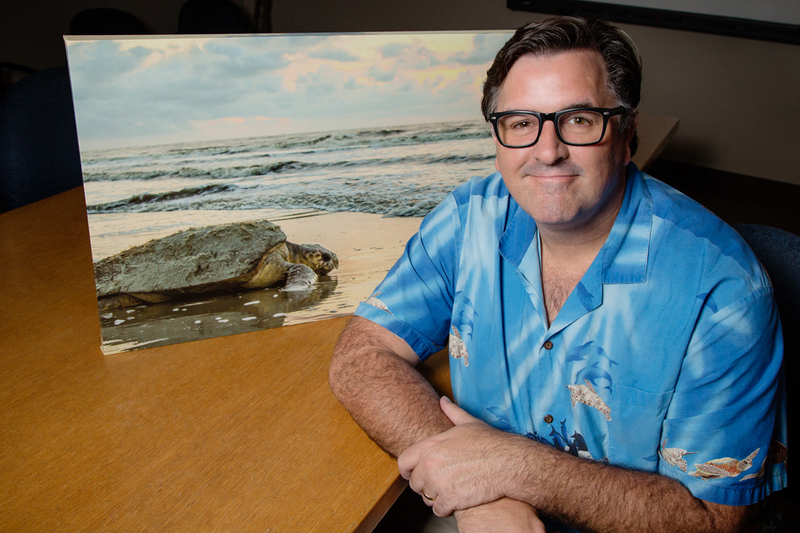 Veterinary clinical medicine professor Dr. Mark Mitchell and his colleagues studied the nesting habits of leatherback sea turtles. 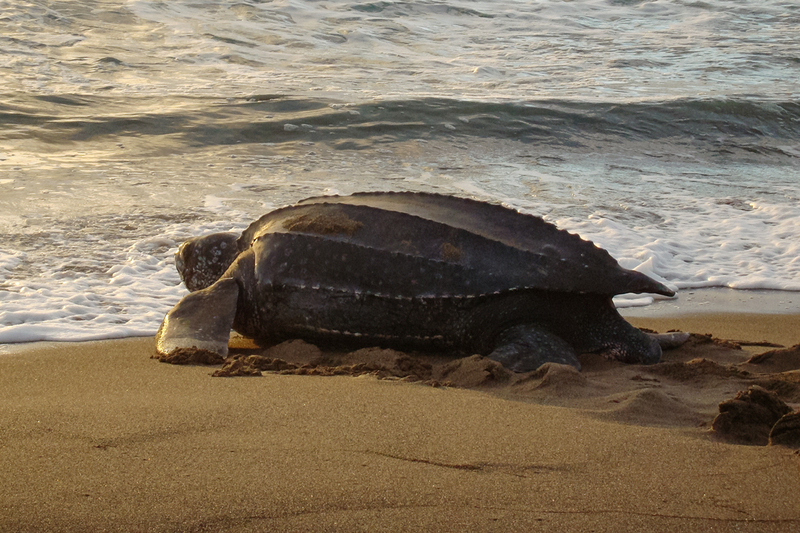 The researchers focused on leatherback sea turtles nesting on St. Kitts, an island in the West Indies southeast of Puerto Rico. The team wanted to know what factors influence where and when the leatherbacks lay their eggs. The information will help conservation efforts and improve the ecotourism experience, Mitchell said. Other studies of sea turtles suggest that characteristics of the sand, the slope of the beach and proximity to vegetation contribute to the success or failure of nests, but “no study has tried to determine what factors cause female leatherback sea turtles to dig a nest in a particular spot, or what factors contribute to when they come up to nest,” the researchers wrote. To determine whether this was so, the team tracked leatherback sea turtles’ behavior on St. Kitts during the 2008 nesting season, from May through July. This meant walking a 4-kilometer stretch of natal beach every night between 8 p.m. and 8 a.m. looking for turtles. The researchers kept track of air and water temperatures, humidity, wind speed, the lunar phase, cloud cover, the tides, and levels of natural and artificial light. They also studied the sand in the nest sites and in two control sites per nest, measuring its temperature, pH, conductivity, moisture content and grain size. In total, data were collected for 27 leatherback nests and dozens of control sites. Conductivity is in part a measure of the wetness of the sand, Mitchell said. Some turtles will start to dig one or two nests before finding a spot where they’ll lay their eggs, Mitchell said. “Maybe they’re picking up on the coarseness of the sand and how well it will pack to ensure that their nest chamber is going to stay structured,” he said. Human encroachment on leatherback nesting sites, in the form of beachfront construction and sand mining, is a major threat to the animals’ continuation as a species. The researchers saw evidence of both on the shores of St. Kitts, Mitchell said. Mitchell hopes that a better understanding of the leatherbacks’ nesting habits will increase the likelihood that ecotourists will show up when the turtles are nesting. This would boost ecotourism and incentives to protect the turtles’ nesting habitat, he said. To reach Mark Mitchell, email mmitch@illinois.edu. 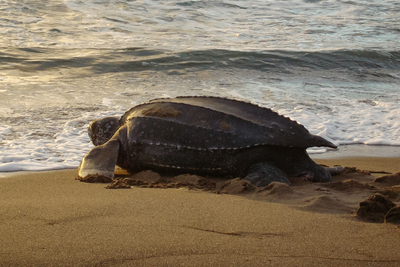 The paper “Evaluating environmental and climatic influences on nesting in leatherback sea turtles (Dermochelys coriacea) in St. Kitts, West Indies” is available online or from the U. of I. News Bureau.